Pantry Pests may be a disgusting surprise but they are not an uncommon one. Pantry Pests invade stored foods such as cereals, flour, grains, baking mixes, crackers, pasta etc. 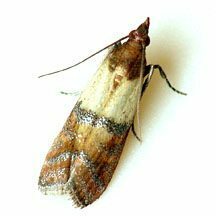 The most common type found in New England homes is the Indian Meal Moth. Look for signs of infestation in cupboards or on counters, look closely inside stored food packaging and for spilled food behind appliances. To learn more about the Indian Meal Moth, click on the profile link.